In 2008, German publisher Steidl released a new edition of Robert Frank’s photographic masterpiece, The Americans complete with an introduction from Jack Kerouac, an artistic match made in heaven. If there was anyone who could communicate the incredible shadow and silence of The Americans, it was Jack Kerouac. “The humor, the sadness, the EVERYTHINGNESS and the American-ness of these pictures!” he exclaims, his words burning with an urgent fever, the kind of heat that sickened and excited the Beat generation and turned the rest of us on to the bright madness of America in the mid-1950s. Modern readers might not expect to find much within the glossy pages of The Americans. What was once considered innovative and ground-breaking when the book was first published in 1959, might be dismissed as antiquated or even unimpressive by today’s standards of artistic and cultural quality. But as I flipped through the book, staring deep into the shadowed landscapes of American faces and places, I was surprised not by how much has changed, but by how much has remained the same. 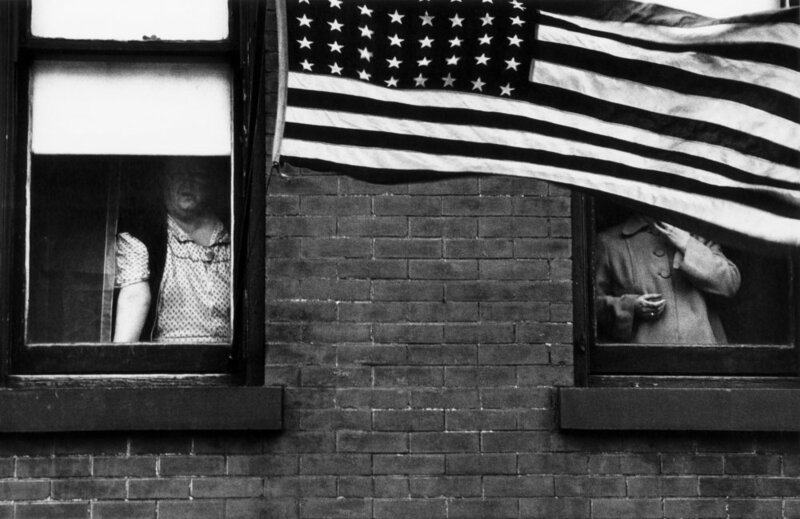 In 1955, Frank captured an America mired in contradiction; a country swollen with pride, fortified from its latest military victory, and yet teetering on the brink of total political and social upheaval. In 2017, we’re not so far removed from our past. Images of black Americans occupying the backseats of city buses, serving as caretakers for snow white children, peering back at the photographer with suspicion and unease as he stands behind them to take their picture are startling in their familiarity. And while the institutional status quo of Jim Crow continues its slow and steady deterioration, these photographs bring our attention to a legacy that we must remember if we are to move forward with grace. The subjects in The Americans are fragmented – familiar strangers, their faces captured in profile, half-obscured by darkness and blurred by the haze of unwashed window panes. Bodies blur together in the street, melting out of the frame as they carelessly walk through the shot and into oblivion. Moody starlets lounging alone at Hollywood film premiers. Children drowsing by a jukebox in a candy store in New York City. Newlyweds, mugging for the camera in Nevada. Grim black faces creased with mourning at a funeral in South Carolina. They are the pieces of a broken whole. Scenes of glamour, romance, and relaxation blend together with moments of grief, racism, and political unrest. “Robert Frank, Swiss, unobtrusive, nice…he sucked a sad poem right out of America onto film,” Kerouac wrote, noting that perhaps it was Frank’s position as an outsider that allowed him to see into the heart of a nation with such honest intensity. With an almost delicate kindness, Frank pulled down the nation’s veil of grandiose patriotism to reveal the anonymous pain of its people – a pain that we are still trying to process and surpass.